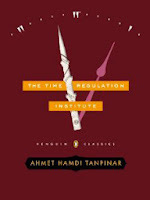 Ahmet Hamdi Tanpinar's The Time Regulation Institute (Penguin, 2013) is a mid-20th century satire by one of the most respected Turkish authors writing novels in the Western tradition. I must admit, I would have been unlikely to have read it without the urging of the publisher, who sent me a copy to review prior to its release in January 2014. It concerns Hayri Irdal, an anti-hero who is in one sense the classic 20th century narrator, quickly establishing his lack of trusworthiness. We learn within the first two paragraphs that not only is he uninterested in reading or writing, he also spent years as a psychiatric patient. Tanpinar's novel is an allegory for the adjustment of an old traditional Turkey under the Ottoman Empire, to the modern Western values adopted for the country by their ruler Ataturk, a clash of cultures which included the adoption of Western time. The first-person narrative voice of Hayri has an antic likableness, something akin to Gogol's madman - a hapless fantasist - or (if he had a voice) Chaplin's tramp. We learn first of his years of deprivation, mental illness, and poverty during the waning years of the Ottoman Empire, his apprenticeship to an alchemist and egoistic mystic, then of his psychoanalytic treatment, and finally of his involvement in the establishment of an institution for the regulation of time and time pieces, and his subsequent fame as an architect and widely read author. The founding of an institute for the setting of watches is patently absurd - the situation evokes another classic 20th century absurdist - Kafka - in its parody of bureaucracy. The institute is based on an historical figure - Ahmed the Timely - whose biography Hayli writes, although he never actually existed. An orchestral conductor is hired to direct all typists to type their letters in unison. A lazy man is hired to head a department to which work is sent when it is to be deffered. Hayli develops an elaborate punitive system of fines for keeping time incorrectly. The only way to set one's watch is to pay for the service by stopping at one of the institute's stations. These are staffed by attractive young men and women in uniform trained to behave with a mechanized politeness to customers in a fashion that presciently prefigures the ubiquitous presence of Starbucks or MacDonalds. In some ways reading this novel was quite challenging. The setting, the Turkish names and honorifics, were entirely unfamiliar to me and I struggled through the early sections of this novel to keep the names straight and because Hayli's endless mishaps seemed merely to pile one nonsensical situation upon another. Then, Hayli meets Dr. Ramiz, who practices an absurdist rendition of one of the ultimate modernist inventions of Western culture - psychoanalysis. Although the novel sends-up of its methods, Hayli is transformed, westernized, that is, "cured." It is the doctor who introduces him to Halit Ayarci, a man with a vision, who improvises the idea of the institute based upon a story of Hayli's. While Tanpinar's institute turns the idea of the modern bureaucracy on its head because it delivers a service that no one needs but everyone pays for, how far is this from the transition our own country recently made from a product-based to a technology-based economy? The reward of The Time Regulation Institute comes to the Western reader who persists. In being steeped in Tanpinar's evocation of the Ottoman world, its tempi, its expectations, even though they felt foreign at the outset, the transition to Western ways became disorientating to me as well as to Hayli. When Halit Ayarci establishes the institute, he does so over the objections of Hayli. Hayli was the voice of logical objection, which was more or less my own perspective, so I become allied with him, that is, he spoke for me. When Hayli finally does goes along with the plan, so then do we. This is a brilliant use of subject and object, because it does not merely gain our sympathy, it hijacks our point of view, facilitating our adopting Hayli's as our own. The reader then is not just amused by the satire, which is clever enough to be entertaining, but we are treated to a transformation of our perspective - and isn't this the reward of a work of art?